All interactions flowing to Virtual Contact Center are channeled through queues. The queues in turn direct them to agents based on their skill level and availability. An agent has to be a member of a queue to receive any interaction from the queue. Virtual Contact Center provides sophisticated logic for matching customers to the agent who can best solve their problem. Queues direct interactions based on the skill level of agents serving the queue. If you have an agent with high skill level vs. an agent with low skill level, the interaction will be directed to the high skilled agent based on their availability. As an administrator, you can assign the selected agent to previously defined phone, email, chat, and voicemail queues. Once assigned, the agent receives interactions channeled through these queues. You can access queues via Agents > Queues. Select a Skill Level for the agent serving the queue. Click Assign All to assign the agent to all queues, or select individual queues and click the check box to assign. You can disable any queues by clearing the Enabled check box. Assign All Select the option to assign an agent to all the available queues defined in the tenant. For custom queue assignments, select individual queues, specify the agent's skill level, and assign. You can also assign agents to queues at the same time you create the queue. 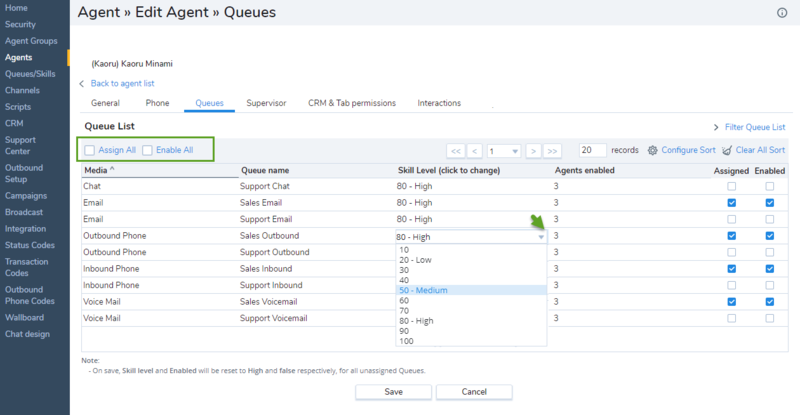 For details on assigning agents to a phone queue as part of queue creation, refer to Assign Inbound Phone Queue Members. The same concept applies to all other types of Virtual Contact Center queues. Enable All Enables interactions from all queues automatically on assigning. Queue Name Displays the name of queue, such as Support or Sales. Skill Level (Click to change) Indicates the skill level of the agent for that queue. The skill level determines the routing of interactions within a queue. Virtual Contact Center attempts to direct interactions to an agent with a higher skill level before directing them to an agent with a lower skill level. Skill levels are now indicated by ten numerical values ranging from 10 to 100 with an increment of 10, with 10 being the lowest value and 100 being the highest. Assign the agent's skill level from the drop-down menu of options. Agents Enabled Indicates the total number of agents in each queue whose accounts are enabled. Assigned If selected, assigns an agent to the selected queue and automatically enables interactions from that queue. You can assign agents to queues at the same time you create the queue. Enabled Allows the agent to receive interactions from a selected queue. You can assign a queue but choose to temporarily disable it. The next step is to define supervisor privileges for the agent.